Get the distinctive elegance of polished metallic frames combined with the colorful economy of our most popular engraved badge materials. 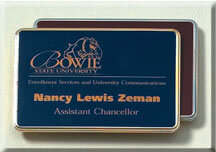 Color logos must go on a laminate rather than metal badge material. Below is an example of a metallic finish. The logos, trademarks and designs shown on this web site are not meant to imply the endorsement of their owners but rather to demonstrate our ability to reproduce them accurately on badges.